There are many reasons why clients depart for other investment firms. But do advisers know what the most likely reasons are? Advisers start out with a disadvantage: The investment management industry does not rate highly on the trust scale. Although the trust deficit has come down somewhat over recent years, financial services is still close to the bottom when compared to other industries, according to the 2016 Edelman Trust Barometer. The trust gap is a global phenomenon and in order to close it, industry leaders need to understand the factors that create or destroy trust. This is one reason why CFA Institute partnered with Edelman in 2013 to create the first ever Investor Trust Study. In addition, the survey found that investors value and expect certain behaviors from their financial services professionals: to work under formal ethical codes or professional standards; to be transparent about all things, including business practices, fees, and potential conflicts of interest; and to act responsibly during an issue or crisis. All in all, investors care that their interests are promoted and want those interests to come before those of the financial professionals and their firms. Investment costs are even more important than performance to global investors and firms are not meeting expectations in that area. Institutional investors rank ethical standards above all else when it comes to the firms they hire. Transparency and cyber security are key concerns. A third of investors believe that another financial crisis is likely within the next three years, and about half of investors lack confidence in their firms’ ability to manage through such a crisis. One section of the report deals specifically with why investors might fire their current investment firm. Among the findings: Underperformance is still inexcusable and is the main reason cited by 53% of retail and 60% of institutional investors for leaving a firm. But underperformance is far from the only reason why they’d make a change. Fees can be a deal breaker. According to the survey, 46% of retail and 50% of institutional investors cited a significant hike as the top reason to give notice. 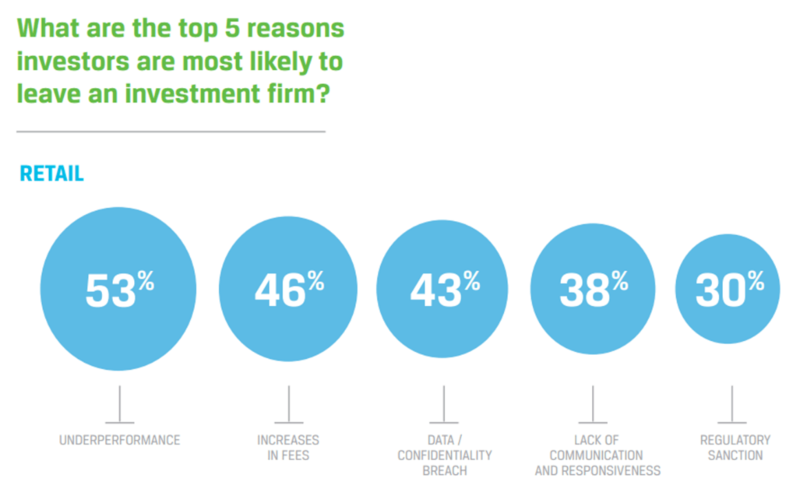 Confidentiality and the security of private information are also critical, with 43% and 45% of retail and institutional investors, respectively, identifying a breach as the leading cause to leave a firm. Investment professionals and firms also need to protect their reputations in the marketplace and communicate and engage effectively with their clientele. It is very hard to build and maintain trust if professionals communicate poorly or do not provide adequate attention. This explains why 38% of retail clients and 40% of their institutional counterparts would rather find a firm that is easier to connect with. Even if investors aren’t directly affected by a regulatory infraction or sanction, any instance of regulatory misconduct can damage a firm’s reputation enough that clients leave. Both retail (30%) and institutional investors (39%) confirmed that a regulatory sanction might lead them to change firms. But the CFA Institute/Edelman study only focuses on why clients would take their business elsewhere. What do finance professionals think would cause clients to leave? In order to gain some insight into that question, we polled CFA Institute Financial NewsBrief readers. What is the greatest reason that drives clients to leave an investment firm for another? So are professionals and clients in sync about what may drive clients away? It’s hard to say. Professionals should care deeply about underperformance because not meeting client expectations will certainly impact trust. Trust is also very hard to maintain whenever there is difficulty communicating or responding effectively to clients. But due to competitive forces and the evolution of the wealth management industry, clients are expecting even more from investment professionals. It may not be long before cyber security, fees, and ethics become paramount as clients find their inability to ensure privacy or negotiate on fees as intolerable as poor performance.